If Milan was in your family, she would be that one sleek cousin who’s basically a model, always wearing heels and looking effortlessly put together. Chances are she’s got a few Prada handbags, but chances are also that she has likely worked really hard for them. Milan is a modern business city. It is very industrial in parts, lots of offices with people in suits buzzing around, phone in one hand and briefcase in the other. These people work hard during the day, and then really know how to make the most of their time off by drinking with friends along the canal or traveling on the weekends. You can feel that the city prides itself off of its metropolis mentality and everything seems to run smoothly. Amidst the cobblestone streets full of Vespas and muted, warm-colored apartment buildings you’ll find small sights and places to visit: favorite cafes, beautiful churches, museums and markets. There are many small things to check out to keep busy in Milan. However, the one main thing to do is inescapable… The Duomo. The massive, gorgeous, white marble cathedral in the center of the city. It is the largest church in Italy (not including St. Peter’s Basilica in The Vatican), and the fifth largest in the world. It took almost six centuries to complete, and no wonder, because it is incredibly detailed and ornate. One of the nails from the crucifixion is kept as a relic at the front of the church and some say that the marble they used to build the church was extracted directly from the downtown Navigli canal! Its really beautiful, but unfortunately some of this pleasure of the visit is taken away from the tourist trap that it has become. You have to wait in three different lines, you’re funneled into the gift shop, there are strict dress regulations, and no one that helped us was even remotely friendly. So while it is striking to see the insides of the church, it wasn’t a great experience. With your ticket inside you’ll also get access to a small Duomo museum with old stone gargoyles (there are currently 135 on the church exterior) and a giant gold Madonnina statue. You also get to go through a tiny pink church called San Gottardo di Corte. Just adjacent to the Duomo in the same plaza is a massive beautiful indoor shopping mall, The Galleria Vittorio Emanuele II. This 19th Century gallery has intricate sculptures, dramatic frescoes, and a clear glass ceiling. I honestly don’t understand how anyone could actually shop here, I would get completely distracted. Inside the gallery are all of the most expensive designer shops, Prada, Gucci, Louis Vuitton, blah blah and blah. While these shops aren’t made for travelers on a budget, it is still it worth it to wander around and take a look. The city architecture is a strange mix between new and old, it really depends on what neighborhood you’re in. Some areas have very generic, gray buildings, while others are full of colorful walls, shutters, and intricate street art. There are two neighborhoods outside of the Duomo area that have this more interesting, developing character and for this reason are becoming increasingly more trendy, Brera and Naviglio. Brera is an ritzy, artistic area northwest of the Duomo with a few museums, like the Pinacoteca, and nice churches. This one above is called the Santa Maria del Carmine. We unknowingly stumbled into a Sunday market with antique maps and furniture, vintage clothes and jewelry. You can tell that the neighborhood has got a pretty high price tag, all of the apartment buildings are beautifully intricate with huge doors, colorful shutters, stone columns and plants dangling of the balconies. If you walk through Brera towards the west, you’ll come across a huge green park called Parco Sempione, which is home to Castello Sforzesco, a 14th Century red brick fortress with old drawbridges and moats. The castle is now full of different art and science museums. We roamed around the park people-watching and eating popsicles in the sun. The other neighborhood that is definitely worth a visit is the Navigli District. If you continue south you’ll come across some picturesque canals, lined by taupe, yellow and orange buildings. This area is really up and coming, as well as home to a more young and diverse part of the Milan population. There are a ton of art galleries, bookstores, restaurants, and many of the bars along the canal compete for the best aperitivo experience. The aperitivo is super popular in Northern Italy, when you pay 8 or 10€ for a drink (probably 99% of those would be Spritz) and get access to a large buffet of basically full course meals. Not a bad deal, huh? One great thing about all of this exploring in Milan is that the public transportation is excellent! You can hop on a tram or bus to check out one of these neighborhoods instead of walking everywhere which can be a nice change of pace. Tickets are supposed to be 1.50, but every time I got on the driver just waved me through. I didn’t see anyone actually pay… so take advantage of that! Overall I would say that Milan is not a top European travel destination. We did everything that we wanted within one day. The city lacks the history of Rome, the art of Florence and the charm of Venice; however, it doesn’t mean that it should be overlooked. What Milan has that many Italian cities don’t is the contemporary practicality of a growing metropolis. There are plenty of fun things to do and see. Thankfully, you can tell that while business is always advancing, the Italians still hold strong to their love for traditional art, food and culture. So, while Milan may not have so much to do monument-wise, it is still worth stopping by for a weekend or using it as a hub to explore the rest of Northern Italy. Looking for a relaxing day trip away from the business buzz of Milan? Catch the train and head North to Lake Como, a long, winding lake tucked at the base of the Italian Alps. Lake Como is renowned for its natural beauty. Many people in Europe refer to Lake Como as a popular resort destination. The seemingly most popular fact being that George Clooney has a summer home on the lake… Ok, cool I guess. But all jokes aside, this lake is not just for superstars, it is a very doable and incredibly worthwhile trip. You can spend your day exploring colorful villages, visiting lavish villa gardens or old Roman castles, and indulging in pasta and gelato at a lakeside café. I mean, who’s to say, maybe you will even catch a glimpse of George cruising his boat around the lake! Lake Como meanders through the valley between the mountains. Each pocket of water along the coast holds its own little town perched along the hillside with colorful houses and stone churches. Although, this beauty is not totally easy to come across, because it does require a bit of planning. Within one day from Milan, you can easily hit three small, lake towns: Como, Bellagio and Varenna. So hopefully this can come in handy for someone. You can buy train tickets ahead of time at trenitalia.com and the ferry tickets the day of. Make sure to check schedules, because the ferry online runs twice a day. And check the weather too, because you definitely don’t want to take a two hour ferry ride in the rain! *You could surely do the same trip in reverse if you prefer, but I recommend it this way because Varenna is the perfect place to have dinner and watch the sunset. Once we arrived in Como, we walked through the cute downtown, past a town hall and university building towards the lake. It was a quiet and cloudy morning, so we peacefully strolled through plazas surrounded by pastel-colored buildings. The architecture actually reminded me of the buildings in Salzburg and Innsbruck, which makes sense because the lake was controlled by the Austrians for a few decades in the 1700s. It was also originally founded by the Greeks, Caesar sent troops there in the first century BC to protect trade between Italy and Switzerland. Clearly, this territory has always (and will always) be highly sought after. In downtown Como there was a street market with local meats, like boar and prosciutto, and cheeses and wines. A happy, old man was playing a piano in the square next to the main cathedral, Cattedrale di Como, which by the way, is gorgeous inside and out. This Piazza Duomo is the perfect place to get a morning cappuccino. After wandering around the shops in the downtown, walk along the lakeside and through the narrow residential streets to the Funicular, Funicolare Como-Brunate. You can pay a couple euro to ride an old, red cable-car up to the top of a hill where there is a small town called Brunate. Its a short, fun ride; you can see beautiful villas built on the slopes while also enjoying the incredible, mountain views. At the top there are some shops, terrace restaurants and houses. We ran around taking pictures and followed the soft sound of an choir singing a capella into an elegant, open-air cathedral, the Chiesa di Sant’Andrea Apostolo. After hurrying down the funicular, we boarded the ferry and enjoyed the trip to the next town, Bellagio. The ferry was quite crowded with tourists, but of course for good reason. It was absolutely beautiful. The alpine crystal waters contrast perfectly with the warmly-colored houses and the deep emerald hills. Bellagio proved to be a much more charming village than Como. It is also probably the most touristic of the three cities. You can spend your afternoon strolling up and down the cobblestone staircases built on a hillside, checking out small shops, wine bars, art galleries and cafés. Lots of the apartments have hanging plants and beautiful wrought-iron balconies with lakeside views. It would be nearly impossible to not enjoy the stone arches, spring flowers and fairy-tale like atmosphere, and of course, the smell of fresh baked pizza wafting through the alleyways. There are unlimited choices of food, but we had a yummy lunch at a corner restaurant called Vecchio Borge. After we wandered around, check out a couple old churches and strolled through the strolling through the Parco Martiri della Libertà. Before hopping on the next ferry we got pistachio gelato. Like I said… its impossible to not be happy here! Once we had our fill of beautiful Bellagio, we decided to move along to our last stop, Varenna. So we hopped back on the ferry for another short ride. While the three lakeside villages are small and similar in style and architecture, they each have their own particular feel, thanks to the different layouts and monuments. Varenna is known for its small-town, sleepy, fisherman vibes, lavish garden villas and the Castello di Vezio. Although we didn’t make it up to the castle, we spent a while getting lost on the small, winding streets. We often followed the bright colored walls, choosing our route by whichever direction seemed most appealing at the time. But even around every nook, cranny and corner of the village, the lake is almost always in sight. We stumbled upon many narrow, photogenic stairways and churches covered in moss and ivy. The main cathedral, San Giorgio is a 14th Century stone masterpiece with painted fresco ceilings. Tempted by seeing the hundreds of refreshing, pink Spritz drinks, we settled in to eat dinner at a restaurant along the water called Bar il Molo. We had paninis and gnocchi while sipping our summery cocktails and watching the sun set across the lake. Couldn’t get much better than that. Honestly, after having been to a few different parts of Italy, I can confidently say that I think Lake Como is the most beautiful place I’ve seen in Italy… and MAYBE even one of the most beautiful places I’ve seen in Europe. When I reflect upon my weekend trip now, I enjoyed our day at Lake Como much more than the city of Milan itself. Nothing against Milan, these small towns are just breathtakingly unique, and incredibly manageable. You feel so productive after having seen three towns in one day! I would even fly into Milan solely for the purpose of returning to the lake. So trust me (and Caesar and George), its worth the trip. The Canary Islands are a chain of Spanish islands off of the Western coast of Africa. 2,000 km away from Madrid, and less than 500 km from Western Sahara, the climate is much more similar to Africa than Spain. You’d think that such an exotic place might be hard to get to, but it is an extremely doable weekend trip. Round trip flights from Madrid were around 60€ and the flight is only an hour. Ideally, you could spend weeks exploring all of the Canary Islands, hopping from one island to the next. But we spent our weekend in the largest, and probably, most popular island called Tenerife. Some people regard Tenerife as a beach-resort island that has industrialized with modern tourism and attracts many older British tourists, which yes is true… Although you also have to recognize the distinct, fun-loving local culture and appreciate the amazing outdoor opportunities that the island has to offer. I think that many of the cities along the coast are tourist overkill with holiday homes, water parks and resort clubbing. But thankfully with a bit of planning, it is easy to escape the hustle and bustle to find the pure, striking beauty of Tenerife. We strategically stayed in a resort town on the western side of the island called Los Gigantes (The Giants). It is a small, coastal town known for the Acantilados de Los Gigantes, these large cliffs that tower 2000 feet over the beach below. The town has an old district with a port and restaurants, and a more developed section with colorful apartments near a black sand beach called Playa de la Arena (Beach of the Sand…. wait what?). The main benefit to Los Gigantes is the proximity to other sites on the island. We rented a car for two days so we could have unlimited access to all of the best, hard-to-reach spots of the island. Tenerife’s public transportation is known to be horribly unreliable, so I highly recommend renting a car. From Los Gigantes, you are close to two of the two most beautiful places on the island: El Pico del Teide and Masca. You can tell I was happy to be driving again. The island has an incredibly dramatic range of landscape, from luscious jungles to soft, white sand beaches and mountains of black, volcanic rock. So we decided to begin with the latter, the most obvious decision. In the center of the island is a massive volcano, the Pico del Teide. This volcano is part of a giant national park, Parque Nacional del Teide, which is probably Spain’s most famous national park. So we couldn’t not go! We drove up the narrow, winding roads through green fields of flowers and suddenly we were hit by Mars-like deserts of volcanic rock and steep, jagged cliffs. The whole park is considered a World UNESCO site and is the home to hundreds of incredible landmarks and hikes. However, the main sight is Mt. Teide, the highest peak in not only the islands, but in ALL of Spain. The volcano is not currently active, the last time that it erupted was 1909. Most people go directly to the snow-covered peak and take the funicular, or hike the tough 5 hr trek up to the top. We decided to do a smaller hike around the backside of the volcano where we climbed giant boulders, found black volcanic rocks and played in patches of snow. We left the park from the northern access road. As we drove further away from the rocky, volcanic landscapes we once again entered into the lush, green terrain of rolling green hills with terraced gardens and tropical plants. We stopped at a tourist site, a park called the Parque del Drago, which contains a giant old tree called the Drago Milenario del Icod de Vinos, or the Millennial Dragon Tree. This giant, raggedy tree is guessed to be at least 1,000 years old, some studies even take it back to 3,000 years ago. You can see the top of Teide in the background! The beautiful park is also home to an old cave where they found human remains. Homo sapiens have been inhabiting the Canary Islands for thousands of years, the original inhabitants likely came from Tunisia and Morocco. The earliest identified tribe is called the Guanches; this colony’s mummies have been found scattered across the Teide national park and in this cave. Some carbon dating has push back the possible earliest settlement date to 200 BC! After stopping at the park, we hopped back in the car and drove to a small town on the Northern coast called Garachico. Garachico is not often considered a tourist destination, but there are natural volcanic rock pools that are open all day and free to the public. So we went to check it out, and it turned out to be such a great spot! We waded in the pools, found some huge blue crabs and watched the sunset while drinking beer on the rocks. On the way back to the car we were lucky enough to stumble upon a festive Carnaval parade. The entire town was out parading around in crazy costumes with drums and trumpets. It was quite an impressive site! The next day we went to an area on the Northwest corner of the island called Masca. This spot is not so far from Teide (maybe an hour drive), but it is completely different in respect to landscape. While Teide is rocky and dry, Masca is a rich, green rain-forest. We had a private car take drive us 45 minutes to the small village of Masca, where we were quickly amazed at the increasingly dramatic views. Every winding turn was a new, spectacular view of jagged cliffs and mountains with the deep blue ocean backdrop. The driver was a young guy, born and raised in Tenerife. He had never even left the island and he said he has no desire to. We pulled over multiple times during the ride to enjoy the views as our driver pointed into the distance naming the other islands. The hike that we did is called the Masca Barranco. Before heading down to the hike, you can soak in the breathtaking view from above the village of Masca. The village is so isolated that it was one of the Guanche’s settlements that was last-conquered by the Spaniards, who often stopped in the Canary Islands on the way to the Americas. You can walk through the village to the trailhead of the hike, stop at the small cafe/gift shop and buy ripe bananas on the street from a local vendor. The hike is a straightforward 2.5 – 3 hr walk between two striking, high, black cliffs that leads into a grassy clearing and eventually a small, secret beach alcove. During the trek you’ll come across sugar cane, banana trees, rock arches, small waterfalls and hidden pools. A small stray dog followed us through part of the hike, and we met many friendly travelers along the way. I can honestly say that this is one of the most beautiful and entertaining hikes that I have ever done … which is really says something! The rough terrain proved to be quite a scramble at times, but overall it wasn’t a especially difficult hike. Once you arrive at the rocky beach you can buy a coke and enjoy the sun and waves while waiting for the boat to take you back to Los Gigantes. You can pay a few euro for a short boat ride from the dock at the end of the hike to Los Gigantes, the town nearby where we were staying. The water sprayed onto the sides of the boat as we zoomed by the steep, dark cliffs back towards Los Gigantes. It was a lovely way to end the day. All in all, Tenerife is a wonderful place to visit. After seeing basically the entire western half of the island, I can confidently say that I would never want to actually live there. It is simply too isolated, and many southern cities that we passed through (Costa Adeje, Los Cristianos and Las Galletas) have really succumbed to the tourist market. In my opinion they have unfortunately lost some of the wild, captivating flavor that the locals still seem to hold near and dear to their hearts. However, while tourism is inevitable, fortunately there is no limit to the amount of dramatic landscapes, mysterious rock caves and hidden black sand beaches that you’ll come across while exploring this beautiful island. Lisbon is the largest city and capital of Portugal. It is a charming, colorful, historical, ocean-side city with enough character and attractions to keep you busy for weeks. Having been to Lisbon twice now, I feel as though I have a somewhat accurate feel for the city and local culture. In my experience, the people that I have met from Lisbon have been extremely friendly and welcome new travelers, so you don’t have to feel bad about getting lost while exploring or ordering local treats in English! In the center of the city is a beautiful, main plaza called the Praca do Comercio. On one side of the plaza is a large, elaborate arch that leads to a popular shopping street; on the other, is the clear, blue water of the Rio Tejo, a cove right off the Atlantic. The plaza walls are painted a cheery yellow and the white columns create perfectly round arch walkways that surround the plaza. While the chill ocean wind breezes by, the street performers blow bubbles and play guitars… its a very peaceful place to be! Lisbon is perched on a series of slight hills which are traversed with an adorably- practical tram system. Walking up and down the cobblestone hills not only gives you a great calf workout, but gives you great city views and occasional glimpses of the clear blue Atlantic ocean down below. If you wander or take the tram northeast, you’ll head towards the oldest neighborhood of Lisbon called Alfama. Before the 13th Century, Alfama was considered “outskirts” because it lied outside of the city walls; however as Lisbon expanded many of the middle-class workers and sailors moved to live in the area. Now the area still has the medieval ancient charm of small streets and old churches, but it also has trendy restaurants and terraces with unbelievable views. One of the must-see churches in the area is the main cathedral, the Sé do Lisboa. While continuing up the hill past the cathedral, you’ll come across a couple small plazas with gorgeous views of the city and the ocean. The Miradouro de Santa Luzia will come up first on your right and then the Miradouro das Portas do Sol has a cafe with sunny little tables where you can sit and take in the crisp red roof and white wall view. One lost stop for good lookout at the highest point of Lisbon, the Castelo de Sao Jorge, a stone Moorish fortress perched on a hilltop over the city. The first fortification dates all of the way back to 48 BC when the city was considered a Roman municipality. Then it was a Moorish stronghold it converted into a Royal Palace until the 12th century when Portugal’s first king came into power. In 1755 there was an awful earthquake in Lisbon that destroyed much of the castle and local architecture, but a lot of the original structure still remains. You can pay a couple euro to walk through the old castle ruins, check out the archaeological museum and bask in historical greatness and the strong Portuguese sun. If you take the tram south you can head towards a different neighborhood, Belem, by the water with a few of the cities most important monuments. There is a giant former 16th Century monastery, called the Jerónimos Monastery which is now a world UNESCO Heritage Site. On the coast you can also see the Torre de Belem, a celebratory gateway that welcomed ships to the city. About two blocks away is the Padrão dos Descobrimentos, a limestone landmark on the water with sailors with that commemorates the spirit of exploration from Lisbon. The last stop in Belem is to try a traditional pastel de nata (small egg custard tarts with crispy pastry) from Pastéis de Belém, a bakery built in the 1800s. Not only is the shop is gorgeous, with authentic blue and white tiles; they have ancient recipes for local treats, which will blow your mind! Another thing that I love about Lisbon, other than the sweets of course, is the art and architecture. The city is riddled with colorful, porcelain tile buildings, grand, old wooden doors, small walkways and giant graffiti walls. Many of the sidewalks are made of painstakingly detailed mosaics of small color-coordinated stones. All of these little touches add a lot of character to the city. These charming details go hand and hand with the whimsical pastel colored buildings. There is a mix of architectural styles in Lisbon: epic stone Gothic churches, baroque red roofs and soft Italian renaissance apartments with white trim and wrought iron balconies. When complimented with the glowing beach sunset and deep blue Lisbon skies, these buildings make for a perfect photo-op. There is also a glamorous side to Lisbon. There is an area of high-end concept stores and galleries in the Bairro Alto, hundreds of big-name stores that line the main shopping road, Rua Augusta, and there are equally as many posh, local boutiques scattered around the city. Down by the ocean is a new addition, the Time Out market, a sleek indoor food market featuring a dozen different local vendors. I chose a salmon and cuttlefish burger with a black squid ink bun from O Prego Da Peixaria. On the last night of our trip, we were heading back to the hostel to pack up and decided to make a spontaneous walk down to the main plaza. There was a cheery, hippee, Jamaican street band playing right next to the water. The joy that came from the music was contagious, the audience started to dance and sing along, while the sun started to set. It was a magical and relaxing way to end the trip and it made me really appreciate the city for what is really is. Lisbon’s sunny disposition, incredible views, fascinating history and friendly people make for a unique travel experience that you’re likely not to find anywhere else in Europe! While there is plenty to do in the city center of Lisbon, if you looking for some fresh air you should head to Sintra, a nearby fairy-tale town with castles tucked in the rolling green hills of Parque Nacional de Sintra-Cascais. Sounds like a dream, right? Well, it basically is. And its surprisingly easy to make this dream a reality! All you have to do is take the train from the main station, Lisboa Santa Apolónia. Round trip ticket is less than 5€, and it takes about an hour to get there. After the short walk by the park following the main road will lead you to the center. This peaceful downtown has a small plaza near the national palace, charming little shops and cafes on narrow alleyways, quirky little tuk-tuk cars and decorative, pastel color buildings. It is maybe the most adorable place that I have ever seen. You can spend hours wandering the small streets, enjoying the architecture or trying local treats like the sour cherry, chocolate liquor called Ginjinha, or find more pasteles de nata or sardines. After being charmed to death, you may want to make your way up to one (or both) of the two largest attractions of Sintra, the Palacio de Pena (Pena Palace) and the Castelo dos Mouros (Moorish Castle). A car would help, because it is a long walk up through the lush forest hills, or you can opt to hire a tuk-tuk driver – which is the more thrilling, and potentially dangerous choice. Of course, this was our decision. But there is also a shuttle bus that makes the round trip drive for a couple euro. The Moorish Castle was originally founded in the 8th-9th Century, but was reconstructed in the 19th. The ancient stone walls line the hills, providing for spectacular views, and a fun afternoon of exploring. The next hilltop over, in a stone’s throw from the Moorish Castle, is the Pena Palace. This palace is the main attraction in Sintra; it is a whimsical, ostentatiously colored, Dalí-ish looking dream. The palace is surrounded by these thick, magical pine forests and lush gardens, which helps set the mystical atmosphere. This location has always been a meaningful spot because of a supposed apparition of the Virgin Mary. But this site was not always a palace. According to history, it was originally built as a quiet monastery in the 15th Century. However, in the 18th century, the building was struck by lightning and destroyed by the tragic earthquake in Lisbon. Thankfully, Ferdinand II reconstructed the palace in the 19th century, and now it stands as a UNESCO World Heritage Site. The entrance is a bit expensive, but I imagine that it is necessary to maintain upkeep for such a unique place. And it is worth the cost because chances are you won’t find another palace like this! After we took another tuk-tuk down the hills, the sun started to set, illuminating the quaint downtown buildings. We grabbed some food and headed back to the train station to return to Lisbon. It’s always sad to end such exciting days of travel, but the quaint streets and whimsical feel of Sintra will stick in my mind as one of my favorite things about Portugal. I highly recommend making the trip! Who needs behemoth Barnes & Noble chains when you have hundreds of charming individual bookstores scattered around the city. These stores range greatly from traditional Spanish stores with antique maps and grungy vintage treasures, to colorful, contemporary shopfronts that feature raging feminist literature. Here are some of the hottest bookstores in the center of Madrid right now. The white stucco walls and exposed wooden ceiling creates an instant, homey atmosphere as book-lovers stumble in at any time of the day (of course not including siesta hours of 3:00-5:00). This bookstore/bar/coffee shop is located in the popular Malasaña neighborhood, an easy turn off one of the main, local shopping streets Calle de Fuencarral. The full name is “Tipos Infames: Libros y Vinos” (The Infamous Types/Guys: Books and Wine”. You can come here on a late evening and sip a glass of Rioja while browsing the large selection of mostly Spanish narrative literature. The three owners, all friends, embrace the challenge of redefining traditional bookstores by offering frequent expositions, series of author editorials and by creating a welcoming and dynamic space for the community to enjoy. “Nos gusta el vino y pensamos que marida con la literatura, ven a comprobarlo.” — We like wine and think that it marries well with literature, come try it! Desperate Lit. is a small international business with stores in Brooklyn, Madrid and Santorini. This tiny, hole in the wall shop is tucked into a side street near the Opera metro. When you step past the door surrounded by green plants and mystery gift packs, you’ll come across an antique megaphone, a large oriental red rug, and an old wooden guitar sitting in the corner, just waiting to be played. They have a relatively small, yet classic, collection of English, Spanish and French books, seemingly focused on smaller name poets and sci-fi authors. The business is interested in recycling literature, so they offer to buy and trade second-hand books that are in good condition. Steps away from one of the busiest metro stops, Callao, and across the street from a favorite Chocolatería Valor is a bookstore called LA Central. The shop includes a fancy (yet a bit pricey on a students’ budget) bistro and cocktail bar, hipster posters, touristy Madrid paraphernalia, and a library mainly comprising of philosophy, history, language and social sciences. The sleek walls holds thousands and thousands of books in several different languages. And the wooden staircase connects three different floors and up to a pretty glass ceiling, so you can enjoy reading in natural light. The store is always full of people, and holds book nights, comedy shows, and forums for new authors to exhibit and explain new works. In the heart of La Latina is this pleasant find, a bookstore that focuses on providing a progressive attitude toward the power of literacy. It is not only store, but an open community that offers a number of presentations, debates and workshops. The store targets a younger generation and encourages political discussion by selling mostly non-fiction books about history, social justice and humanitarian movements. They believe in “el libro como herramienta de intervención” – (the book as a tool of intervention). While I have only stopped here a few times and never bought anything, I respect the mission and think that like-minded entrepreneurs should be inspired to launch similar stores in other cities to touch educated, youths and inspire a well-read environment regarding modern social and political issues. Along with all of these quirky little shops, Madrid also has some outdoor book stands that are open in good weather. You can find old vintage postcards, maps and random second-hand books at the small wooden stand called La Librería de San Ginés, which is built on the side of the stone cathedral wall. On the southern side of Retiro park you can find small blue stands with canvas tops that sell all types of books. They bring out carts onto the street. I have seen books from some of my favorite Latin American authors, Jorge Luis Borges and Julio Cortázar, being sold here. With the right amount of browsing, I am certain that both of these outdoor shops have many treasures yet to be discovered! These few favorites don’t even scratch the surface of all of the reading options available in the city. Overall, it seems that Madrid tend to cultivate an appreciation for art and literature and people enjoy supporting small, local businesses in order to preserve diversity and a genuine love for reading. Hopefully, this post has inspired you to go grab a book! …Or to buy a plane ticket to Madrid! Either one is fine by me. If you are near Portugal and seeking an authentic travel experience I recommend going to Porto! Porto is the second largest city in Portugal and it feels significantly more livable and less touristy than Lisbon. Not saying I don’t like Lisbon, it’s wonderful, but Porto is a north-western land of delicious port wine, working class locals, environmentally friendly artisan crafters, hip, pop-up stores and last but not least, sardines… so many salty sardines. We flew in to Porto expecting the typical gray skies and chilly river atmosphere, but we lucked out when we were greeted with sun. We got to the city center easily by taking the metro from the airport. On the way in we spotted some rebellious teens playing on the train tracks, some stay dogs scampering in the streets and old men working hard on their farms. The ivy creeps up the metro walls made of stone, as the scene was already being set for the city. Porto has this strange, run-down, sort of industrial/apocalyptic feel, which unfortunately has to do with the unbelievable industrial decline and unemployment of the city. However, it also creates a strangely beautiful, grungy personality that is unique to Porto. We stayed in a chic and quiet hostel called Garden House Hostel on one of the main shopping streets of the city. It wasn’t ideally placed in the medieval center of town (called the Ribeira) but Porto is a pretty small city, so the farthest walk was around 25-30 minutes. Close to our hostel along Rua de Santa Catarina are two of the most visited spots of the city, the Majestic Café and the Chapel of Souls. Majestic Café is a ornate, 1920s gold and wooden cafe that is included in UCityGuide’s list of “Top 10 Most Beautiful Cafes in the World”. The Chapel of Souls, or Capela das Almas de Santa Catarina, is one of the most beautiful churches in Portugal, with a massive blue and white-tiled facade. It dates back to the 18th century. While Porto is sprinkled with many beautiful churches, the main cathedral/fortress, the Sé do Porto, acts as the protective mother of the city, overlooking from the top of a hill. This cathedral started being built in the 12th century, so it is one of the city’s oldest and most important monuments. You can get great views of the city from up here. Continuing past the main cathedral, we walked through a residential neighborhood with narrow streets, colorful apartments with stray cats at the door and clean laundry on the line. While meandering throughout the city, I made a point to try to discover the most beautiful tiles (called azulejos), which wasn’t difficult considering that Portugal’s architectural trademark are these small porcelain tiles. 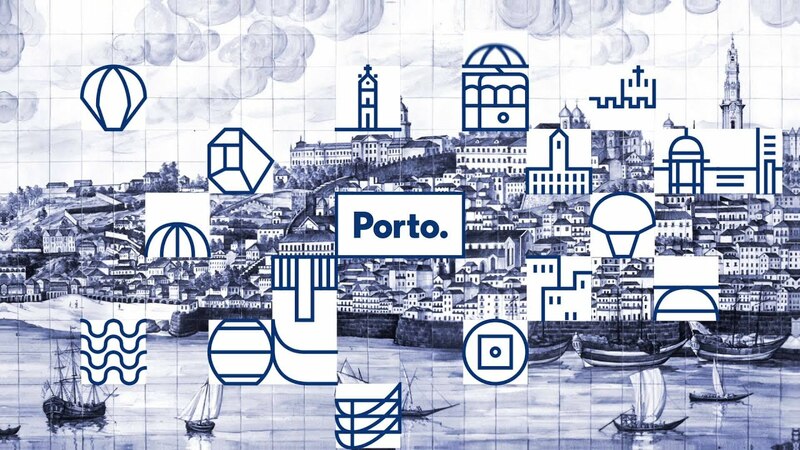 These azulejos first appeared here in the 15th century when the Iberian Peninsula was still mainly under Moorish rule; however, most of the existing tiles in the city were reconstructed in the 20th century in an aim to revive Porto’s intrinsic, artistic personality. The narrow, cobblestone streets will wind you through plazas, past small corner markets and will spit you out at the most charming, tourist street of Porto that is nestled parallel to the River Douro. On this street there is the iconic (yet oh so beautiful) view of deeply colored apartments next to the black iron, double-decker bridge, Ponte D. Luís I. There are bustling cafes, fisherman sitting on the edge of the walkway, men playing the accordion and people shopping at tents with local crafts and trinkets. You can grab a drink, or walk across the bridge to ride the cable car, take a tour of one of Porto’s many fine wineries, or simply to get a wonderful view of the downtown from across the river. We chose to eat in the Praca de Ribeira, a busy, sunny plaza, where I had some port wine and a croquette da bacalhou (Yeah I know… when in Rome!). Heading back inland, there are countless other sites to see. The São Bento Railway Station rivals Grand Central in being one of the most gorgeous train station that I’ve ever seen. Once again, here Porto brings in the colorful tile motif to convert a potentially lifeless and practical place into essentially an art museum and tourist attraction. One of my favorite things about Porto (forewarning: my inner-nerd is about to come out) is that part of the Harry Potter series was written here! JK Rowling lived in Porto for two years while outlining her ideas for the Sorcerer’s Stone. She was a frequent visitor at a popular cafe/bookstore called La Livraria Lello, a neo-gothic bookstore has a grand wooden staircase and stained glass windows. Livraria Lello has since become a major city attraction. You can pay 3€ to check out Rowling’s hangout, which is the rumored inspiration of Flourish and Blotts. Much of her inspiration came from the artsy city vibes. It is rumored that Salazar Slytherian is actually named after Portugal’s dictator from the 1930s, António de Oliveira Salazar. Not to mention – all of the school students wear long, black, caped robes… Curious. Unfortunately, I was not able to find Hogwarts or Diagonal Alley. Sorry to disappoint. Near the Livraria Lello there is a gorgeous church to stop by, the Igreja do Carmo, another blue and white tiled building. This 18th century church has a beautiful garden, a golden organ and an elaborate, Rococo designed facade. Another must-do in Porto is a visit to the Torre dos Clérigos, a tall 18th century look-out tower, which provide a great city skyline view – providing you survive the 240 stairs climb. There are some cool artifacts inside, and a description of other city monuments. While we lucked out with sunny weather, like I mentioned, Porto is usually known for its rainy and moody disposition. Thankfully, not only does Porto have the charm of the old tile churches and small medieval streets, it also has a variety of up and coming areas with shops and cafes so you can stay occupied in the case of cloudy weather. A Vida Portuguesa is a hip concept store to buy natural soaps, local foods and thick, hand-woven rugs. Casa Oriental is a sardine store built in the 1920s with brightly-colored, vintage tin cans. Even if you’re not a sardine fan, it is pretty comical, so it’s worth a visit. And Mercador Café has a charming minimalist vibe, great food and hot chocolate if you’re looking to cozy inside and chat with a friend for an hour or two. My main advice for visiting Porto is to just enjoy getting lost out in the city! Porto doesn’t have a ton of major attractions or monuments, and for this reason it is not such a well-known European travel destination. But I promise, you will not be disappointed. Porto is an endless scavenger hunt of ivy-covered walls, colorful tiles, mysterious old sardine shops and gorgeous antique cafes that will surely keep you busy and leave you feeling as though you stepped back to a different, magical time. Tucked in the low peaks of the Sierra Nevada mountains in Andalucía is the small, rugged, historic city of Granada. A quick train or a five hour drive from Madrid, Granada is an ideal city for a weekend getaway. Surrounded by mountains, and only one hour from the southern coast, Granada is becoming more and more of a prime travel destination. Fortunately, I had already been to Granada before; however, it was under some not so fortunate circumstances. When I studied abroad in Seville we went as a group with the directors as API. But with awful weather and bad timing, none of us really enjoyed the city. So this time I did not have high expectations to fall in love with Granada. On Friday, I arrived and it was once again cold and rainy. I thought to myself… boy, Granada really better prove me wrong this weekend. And lo and behold, it did! Once the sun came out, the city came alive and it totally changed my opinion. I’d now say that Granada is one of my favorite places in Spain, which says a lot! Just like all other cities in Spain, Granada has a distinct personality. It is quite a spicy city! There are a mix of Mediterranean and Middle Eastern tapas bars and Arabic markets tucked into the downtown. Many of the local people are very earthy, a lot of Philadelphia Folk Festival-kind of tattooed hippies with no shoes and dreadlocks. We ran into an old man singing John Legend on the street and a group of pierced hipsters in rags with eye patches singing Jamaican rap near the main plaza. This is only a taste of the lively culture. Not only does Granada have a crunchy-granola type of vibe, it also has an extensive history that has added another layer to the complex character of the city. As a matter of fact, the tough attitude of the granadinos may actually stem from the fact they the city has been through so many transitions of culture, religion and power. Back in the 7th Century, Spain was called Al-Andalus the Visigoths had the majority of control in Andalucía. In 711, the Muslims conquered the city with the aid of a large Jewish community in the Albayzín (old district) and remained there for hundreds of years. After the fall of Seville and Córdoba in the 13th Century, Granada became the richest and most powerful city not only in Spain, but in all of medieval Europe. Thus explains the massive, Arabic fortress that overlooks the city, called La Alhambra. If you look closely you can see the snow on the Sierra Nevada mountains behind the Alhambra. In 1492 the Catholic monarchy, Ferdinand and Isabel, took over the city and expelled the Jews, Muslims and Arabs from Spain (Or at this time it was called Hispania). The city of Granada slumped for the next couple hundred of years. It wasn’t until the 19th century period of Spanish Romanticism when the city reclaimed its identity and embraced its original Islamic heritage. Modern day Granada is known for being a lively university city with an earthy and genuine attitude. It is also especially popular for being the city that gives FREE tapas when you order a drink. My friends and I completely took advantage of this; we never actually got a full dinner, but tried a variety of different drinks and small plates. Friday night when I arrived we went to our first tapas bar, La Bella y La Bestia. There are two, the oldest bar is next to the riverbank at the foot of the mountain, the other is near El Albayzín, the historic Moorish quarter of the city with building foundations that date back to the 13th century. Upon ordering three glasses of wine at our first bar, we we served three sandwiches of jamón serrano and french fries. We also went to a traditional Spanish tapas bar/restaurant that was recommended to us by our Airbnb hosts, called La Chantarela. Hidden within the less-charming, shopping district of the city, this place was packed with locals enjoying the Friday night with friends and family. We got a round of beer (one spiked with tequila called Desperados) and these delicious cheesy, pork rolls. The next day we went to a popular seafood bar called Los Diamantes, right across from Plaza Nueva, the main square in the center of the city. This place came to us highly recommended by both Lonely Planet and Anthony Bourdain, and it was amazing. As it was super crowded, we were able to grab a small corner of the bar and order drinks, the tapa that followed shortly after was a plate of perfectly-salted, fried fish. Other places that I would recommend for food: Café Lisboa next to Plaza Nueva, Minotaur for tapas by the river, Om Kalsoum where we got 8 tapas and a bottle of wine for 15€, and Café Bohemio, a library/jazz bar near Plaza de los Lobos. Now, the food isn’t the ONLY reason why Granada is such an awesome city. In my opinion, the other main attraction is the giant fortress on top of the hill that overlooks the city. This is a view of La Alhambra from the balcony of our Airbnb, a small one bedroom apartment in El Albayzín. Along with the terrace, the balcony also had old wooden ceilings and archways, and tiny, little lizards scampering across the walls. So construction of The Alhambra began back in the 1238 by the Nasrites, specifically the emir Muhammed Al-Ahmar. During the 18th and 19th century the castle became neglected and overrun with trash, bats and beggars. In 1870 the palace was declared a national monument and in 1984 it became a UNESCO World Heritage Site. There are multiple parts that complete The Alhambra experience: Los Palacios Nazaríes, La Alcazaba, La Medina, el cementario, y los jardines y Palacio de Generalife. Over the years the palace has changed drastically, but still has the original Moorish character with old tiles, archways and dramatic sparkling ceilings. With elaborate Arabesque styled details and Islamic calligraphy lining the walls, the fortress exudes a feeling of ancient history, mystery and wonder. The Muslims believed that geometry was the connection between reality and the spiritual world, so the architecture is brimming of shapes, lines, repeated patterns and symmetry. Because the palace is so incredibly unique, historical and beautiful, it has become quite the tourist attraction over the past couple of decades. I was stunned while at one point during our visit, I looked around to see a tour group of thirty Chinese tourists all taking selfies instead of actually appreciating the architecture for what it really is. Because of the fact that The Alhambra gets about 6,000 daily tickets, it is recommended to get ticket ahead of time online or from another source the morning of your intended visit. But even if you don’t have a ticket, The Alhambra grounds are still worth checking out. You can walk through the gardens and enjoy the smell of the orange trees and the trickling water of the ancient irrigation system that lines the paths. You can get into the beautiful central courtyard of the Museum of Fine Arts inside the Palacio de Carlos V or the 17th century Iglesia de Santa María. Of course, a visit to Granada would be incomplete if you didn’t wander back down past Gran Vía and around the city center. The main cathedral is gorgeous, hidden in between colorful apartment buildings, the front facade of the church is along side of a main plaza where children play fútbol and the parents drink their cervezas. If you look past the obvious monuments of the city you may come across the beautiful artistic details that often are under your feet or high on walls. Most paths and streets of Granada are created with small stones and pebbles that are perfectly aligned together in patterns and puzzles. (Which at time, yes, makes it very difficult and distracting to walk). Sometimes on the sides of buildings you can find random plaques with dates and facts, and plates or plants that hang gracefully and provide the city with such charm. These details create Granada’s artistic flair that permeates the city and manifests itself in the daily lives of the people. Up at the Mirador de San Nicholas, an overlook of The Alhambra in El Albayzín, you can find artisan jewelers, leather makers or jugglers. Plaza Nueva is also a popular spot for artisan crafters, musicians and performers. Overall this past weekend I was so happy that Granada finally proved to me its worth as a beautiful, creative city and strong contribution to Spanish culture. It is amazing how much weather can effect a traveling experience, and I almost felt guilty for not giving the city a chance the first time around. Now I find myself thinking that rain or shine, Granada is a unique part of Spain that is 100% worth the visit. For those who haven’t been to Spain, think of this comparison – I like to think that if Madrid is the NYC of Spain, Seville would be like Key West and Granada would be… Seattle or Portland. Not that I have ever actually been there (haha) but I can tell, and have heard from others that the down-to-earth, hip vibes in Granada are especially reminiscent of the Northwestern American attitude. So if you find yourself intrigued, come join me in Spain and go to Granada to see for yourself! With my free time in Madrid I love to spend hours strolling through the famous museums and even some of the not-so-famous art galleries. The three most well-known museums in Madrid are the Prado, Reina Sofia and the Museo Thyssen. This collection is sometimes called “The Golden Triangle” or “The Big Three”. All three of these museums have very different collections of art, different personalities, and attract different visitors. The most famous of the three museums is El Museo del Prado. It’s almost too easy to spend hours wandering through the hundreds of paintings at the Prado. It is the home of some of the most famous paintings in Spain’s art history, from the top three most renowned Spanish artists Goya (1746-1824), Velazquez (1599-1660) and El Greco (1541-1614). Half of the collection is a lot of handsome priests fighting off satanic dragons and chubby flying naked Renaissance babies, which for me gets old fast; however, the other half of the collection consists of influential pieces like Las Meninas and Goya’s “Black Paintings” like Saturn or the Drowning Dog. I learned about Las Meninas for the first time way back freshman year in one of my drawing classes at Bard. For many artists, Las Meninas is the painting that introduced perspective in art. I also studied Las Meninas in relation to Don Quijote in my Spanish Lit. class, and how they both share a kind of self-referentiality that was extremely rare back in the 17th Century. I mean like that type of artistic inception of “a painting of a painting” and “a book of a book” kind of thing. Pictures are forbidden, but here is a photo from Google just to give you an idea of what I’m talking about. This painting was especially unique because it is both a self-portrait of Velazquez and a portrait of the royal family. What the Prado does really well is that it showcases interesting exhibitions, separate from the main collection, that feature different, less well-known artists. When I went back in the beginning of the month, there were a few that I found especially interesting. One exhibition called Meta Pintura “A Journey into the Idea of Art”, another about Jose de Ribera’s expressive sketches and yet another on the still life painting of Clara Peeters. There was also a gallery featuring the works of Hieronymus Bosch (1450-1516), who’s paintings I also studied at Bard. The most famous, and amazing painting is called the Garden of Earthly Delights, three wooden panels displaying heaven, reality and hell. Another thing that really caught my attention was this gorgeous wooden ceiling that was taken and restored from an old cathedral in northern Spain. The second most famous museum within the “Big Three” is called El Museo del Reina Sofia, which puts a more modern spin on Spanish art. Featuring artists like Picasso, Miró and Dalí, this collection is much more contemporary than the Prado. In my personal opinion, everything about the Reina Sofia is more trendy than the Prado, from the art itself to the structure and function of the building. What was originally an 18th century hospital has been converted into a clean, abstract red and gray steel rectangle museum. Construction finished in 1990 and even since then the Reina Sofia has been attracting just as many, if not even more visitors than the Prado. One thing that can be misleading about the building is that there are many different entrances. The main entrance is on the Sabatini north-side of complex. On the other side of the building is an entrance to the upper level temporary gallery. When I was there they had an exhibition about zines. And underneath of the museum is a really hip café/restaurant/bar called NuBel that is worth the visit. You may ask… what is a zine? Its like a mini magazine or collage of words, images, and memories. Anyone can personalize and publish their own zine. The museum has four levels structured around a square central plaza with a garden. There are large glass windows which lets in natural light and the walls are stark white. So it is provides a perfect atmosphere to be able to focus and enjoy art. The majority of the collection is a mix of paintings, sculptures and old books and artifacts on display. There is a clear modern, surrealist, and abstract theme throughout the second and third floors of the Sabatini building. While the collection includes painters from other European countries like Magritte and Tanguy from France and Max Ernst from Germany, there is a strong emphasis in the Reina Sofia on Spanish history and how the art has taken a part in this history. Each gallery has an informational card that welcomes and walks the visitor through some of the most important historical moments of the Spanish 20th Century. Of course the most famous painting in the Reina Sofia is La Guernica by Picasso. While yes, I do hate viewing art with crowds and often try to give a little extra-appreciation to the overlooked paintings in a room, I cannot deny the power and sheer beauty of this painting. There is a reason why it is so famous! 12 ft high and 25 ft long, this black and white masterpiece really commands the room. As I had studied this painting before in college, I felt as though I was really able to appreciate the painting not only aesthetically, but also because of the political message that is so deeply ingrained in the piece. During the Spanish Civil War (1936-1939), a German war plane, assisting the Nationalists and Franco, bombed a small town in the Basque Country of Northern Spain. Picasso’s painting is seen as a cry against brutal war violence and a testimony for the innocent lives that were taken from this event. The chaos of the screaming civilians and the juxtaposition of humans and gruesome-looking animals is silenced by the meaningful, yet muted monochromatic, grayish tones. I believe this could be representative of the many following years of pain and repression felt by the Leftist Republican party of Spain under the Franco Regime. On the third floor of the building is a temporary exhibition called Ficciones y territorios: Arte para pensar la nueva razón del mundo (Territories & Fictions: Thinking a New Way of the World). It is a collection of social realist photographs focused on showcasing the low-come and gentrified suburbs outside of Madrid and Barcelona. There were some political essays to read that accompanied the photos. This genuine exhibition was a breath of air from the idyllic impressionistic style that dominates the Prado and Thyssen. The Reina Sofia is open from basically the same times 10-8 PM all week. However, it is closed on Tuesdays and on Sunday is closes at 7 PM. Every night (M-F) from 7-9 the museum is free, but it usually costs 8€. Now, the third down on the list of museums in Madrid is called El Museo Thyssen-Bornemisza. The Thyssen was a private collection started by a Swiss family back in the 80s, who now have their art on display for the public. The Thyssen has a bit of everything artistically speaking: soft, impressionistic Western landscapes, large modern abstracts, and mixed media explorations. It is like a quick representative journey through art history from the 13th to the 20th century. Famous artists include Rembrant, Dalí, Carvaggio, and a few more modern additions like Roy Lichtenstein and Kandinsky. Some paintings that I especially enjoyed are Piet Mondrian’s “Composition XIII”, Frantisek Kupka’s “Study for the Language of the Verticals”, Lyonel Feininger’s “Ships”, Kandinsky’s “Murnau, casas en el Obermarkt”, Yves Tanguy’s “Imaginary Numbers” and Richard Estes’s “People’s Flowers”. The Thyssen is the less known museum of the “Golden Triangle”. The other day I mentioned the name of the museum to one of my private lesson students who is from Madrid, and she had never even heard of it! While it may not be as popular or as large a collection as the Prado or Reina Sofia, the Thyssen is definitely worth the visit. The main collection of The Thyssen is open every day from 10AM-7PM. On Mondays however it is only open from 12 to 6 PM, but it is completely free. You can just walk right in and start exploring! General admission is 12€, and many can find a reduced fee for 8€. Whether you’re having a luxurious four hour tour in the Prado or just stopping by the Thyssen for a brief stroll on a Monday afternoon, these three museums provide a world of entertainment and knowledge for any type of tourist in Madrid. Come check it out! After skiing for the afternoon we drove back towards Munich and stopped in Innsbruck, Austria to explore the city a bit and get dinner. Innsbruck is a small old town tucked in the northern Austrian Alps, it is the capital of the state of Tyrol. It was about a 45 minute drive from Stubaier Gletscher, so we arrived right around nightfall. We parked right outside the center and walked towards the Old Town, initially unimpressed by a surprisingly large amount of trash and standard architecture. This quickly changed when we coincidentally stumbled upon a massive Christmas parade… There were mobs of children dressed up in white robes with lit candles, people shepherding sheep throughout the streets and men with long brown cloaks holding large wooden sticks with flames. It looked like a medieval scene straight out of Hogwarts or Lord of the Rings. Quite the unique entrance into a new city! We followed the parade throughout the town, occasionally the procession of children would stop to sing Christmas carols. We had no idea what this town wide parade was, but of course it seemed like everyone else did. The entire city was in the center of town for the parade, a lot of local families, which was unlike our more touristy experience in Salzburg. Even though it was already dark, you could still see the gorgeous, old, colorful buildings that line the main streets and were illuminated by the Christmas lights. Once we saw that the parade was coming to an end we walked around the Old Town and saw tons of Christmas markets, lights, restaurants, old churches and a small play being performed for local kids. The city felt familiar, quiet and magical. We made it all of the way to the river, to check out what the bridge and the other side looked like. During the daytime you can see the peaks of the Alps towering over these buildings, but unfortunately in the dark they weren’t as incredibly impressive. We also walked around the Marktplatz market square with a carousel and Christmas vendors. We had thought that Salzburg seemed old, but even from our couple of hours in Innsbruck in the dark I could feel that the origins of the city were even more ancient. There were stone plaques written in Latin of old dates and endless old stones and massive wooden doors. In the main square, which was all jazzed up with a giant tree and a bunch of lights, we got to see the Helblinghaus, a beautiful white building from the 15th Century with elaborate Gothic and Rococo designs. Adjacent to the Helblinghaus is another famous building, the Golden Roof building (Goldenes Dachl) which is one of the main highlights of the Old Town of Innsbruck that dates back to the Middle Ages (1500) when Maximilian I ordered the construction. The roof has over 2,500 original copper tiles, which you can see on the right side of the image. As we were stumbling around the cobblestone streets trying to decipher all of the old signs and guess the ages of the buildings, we were overwhelmed by the echoing GONGS of the cathedral bells, which drew us closer to sneak into the Cathedral of St. James. The cathedral was built in 1180, but suffered from earthquake damage in the 16/17 Century so it was reconstructed. Check out how beautiful the front facade is! As it was getting late, Dad and I decided to wander back towards the car in search for a spot for dinner. I would have loved to stay longer exploring the city, but we still had the couple hours to drive back to Munich. We ended up eating at a strange restaurant called Orangerie. Which worked fine for a quick dinner, but unfortunately, I would not recommend! After doing some research on the parade upon getting home, we realized that what we had stumbled upon was the Christkindleinzug parade, a town wide tradition that has been going on for hundreds of years. Each year the children dress up as angels and shepherds and begin the solemn procession with the sheep through the city at 5 PM. What a beautiful tradition! I could tell that the families of Innsbruck are very proud and tied to their city, which makes me appreciate the culture even more. I loved the mystical feel of walking around at night, so hopefully some day I can get the chance to explore the city during the day!